Pittsburgh Underground: Movies That Have Everything: Valerian and the City of 1000 Planets STARTS TODAY!!! Movies That Have Everything: Valerian and the City of 1000 Planets STARTS TODAY!!! It’s Friday again!!! That means another summer movie to keep you cool (and this one looks pretty damn cool!). Today, Valerian and the City of 1000 Planets sends us on another epic sci-fi journey from one of our favorite directors, Luc Besson. Check out this amazing trailer! 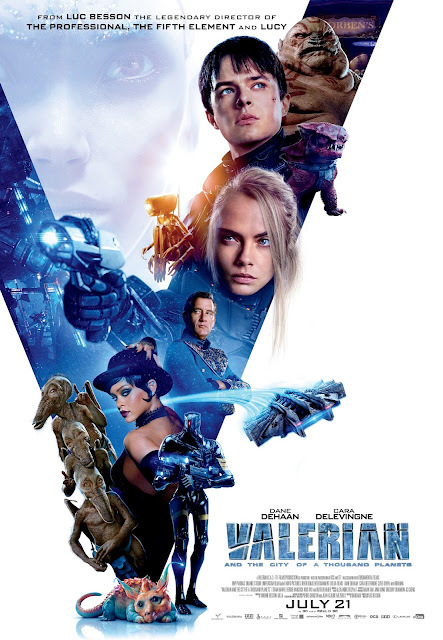 Based on the French comic books written by Pierre Christin and illustrated by Jean-Claude Mézières, we are catapulted into the 28th century where special operatives Valerian (Dane DeHaan) and Laureline (Cara Delevingne)work together to maintain order throughout the human territories. Under assignment from the minister of defense, the duo embarks on a mission to Alpha, an ever-expanding metropolis where diverse species gather to share knowledge and culture. When a dark force threatens the peaceful city, Valerian and Laureline must race against time to identify the menace that also jeopardizes the future of the universe. Also featured are Rihanna (as Bubble), Ethan Hawke (as Jolly the Pimp), our favorite jazz artist - Herbie Hancock (Defence Minister), and Rutger Hauer (President of the World State Federation). Valerian and the City of 1000 Planets flies into theaters TODAY!!! Keep cool everyone!